With sustainable living and environmental impact being such prevalent topics in the world today, composting is a word you’re probably hearing more and more – and for good reasons. There are a whole host of great benefits to composting, including reducing landfill waste, enriching depleted soil, and decreasing the amount of fertilizers and pesticides used in gardening. You may even be able to reduce your waste collection and save some money there as well. Does the thought of starting a compost bin make you a bit nervous? Well, have no fear – composting is much simpler than many people imagine. 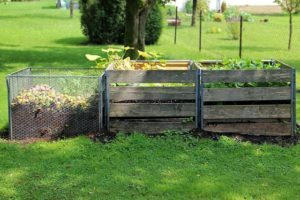 With a little info on composting bins and few simple tips from Architectural Landscape Design, you’ll be well on your way to making great compost for your flowerbeds or garden. When choosing a bin, first think about location. Particularly, you’ll want to make sure it’s close enough to your kitchen that you can easily add vegetable trimmings, coffee grounds, egg shells, and other food waste to it. Then think about style. There are a variety of styles available such as enclosed bins, rolling bins, worm bins and compost tumblers. Some people prefer to have them out in the open and accessible, but you can also design an attractive storage area that can camouflage the bins but still make them easier to get to. While there are many things around your home and yard that will compost effectively, there are certain things that will not. Following the guidelines listed below will help ensure you have an effective start to your compost pile. By composting your yard clippings and food scraps you can both enrich your property’s landscape and take a load off Mother Nature. If you’ve got questions on composting or want further info on ways to fit it into your gardening plans, contact us today. Our Minneapolis-based landscaping experts are here to provide you with professional advice and a customized solution that’s perfect for your specific gardening needs.